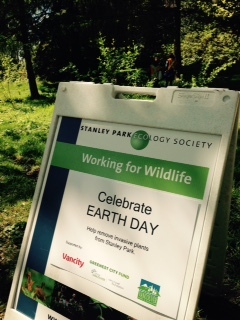 On April 19, 2015, the Stanley Park Ecology Society (SPES) celebrated Earth Day with a unique hands-on event in Stanley Park. Members of the public, the Vancouver Park Board, and MLA Spencer Chandra Herbert were invited to weave invasive English ivy into ‘bionetting’ – used later to creatively stabilize eroded slopes in Stanley Park. Environmental artist Sharon Kallis led the drop-in weaving session atop the Stanley Park Nature House by Lost Lagoon to help showcase the threat that English ivy and other invasive species pose to biodiversity within Stanley Park’s forest and along its shores. English ivy weaving is part of a larger SPES-led project (Upcycling the Blowdown: Phase II) involving the removal and repurposing of a variety of invasive plants that continue to infest Park clearings following the massive 2006 windstorm. SPES showcased the project that day with both the weaving session and a concurrent ivy pulling/removal event along the north edge of Lost Lagoon. 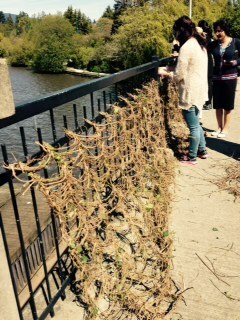 Woven ivy vines dry in the sun. 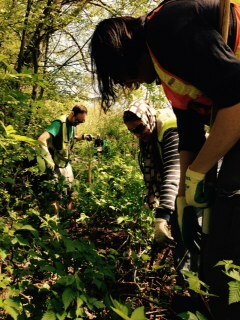 Volunteers pull invasive blackberry from the Park. “Thanks to the generous grant support of Vancity and to the Vancouver Foundation and the City of Vancouver through the Greenest City Fund, SPES is not only continuing its battle against the advance of invasive species within the Park, but we’re now exploring the upcycling potential of invasive species like Himalayan blackberry and yellow flag iris,” says Patricia Thomson, SPES Executive Director. With many hectares of Park still infested, Upcycling the Blowdown: Phase II offers local artists a steady supply of invasive plant material with which to experiment and may serve as a model of invasive species control for other organizations. Since 2007, SPES community volunteers have removed a mass of 3205m³ of invasive plants from the Park – approximately 1.3 Olympic-sized pools full! Earth Day (April 22) is celebrated every year with events across Canada and the world to demonstrate support for environmental protection and action.